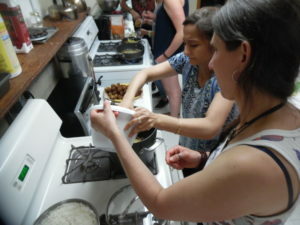 Delna Boyce, an experienced cook originally from India, volunteered to put on an Indian cooking class for the Grange, and did a great job! 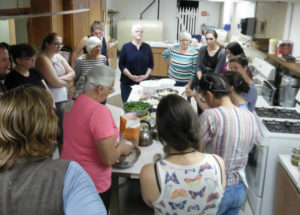 15 participants learned about recipes, ingredients (and where to buy them), spices and the difference between supermarket spices and “real” ones, ways to include more whole grains, and many “tricks of the trade” for making a list of traditional Indian dishes which she has sold at farmers’ markets. 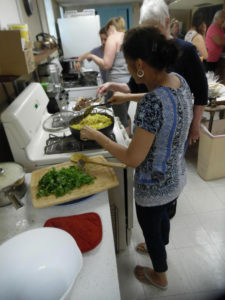 “Delna’s Hits” were hits for the cooks who came to the workshop, and also for the Grange members who enjoyed some of the leftovers at the Community Potluck later that day. 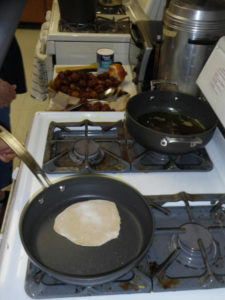 Delna mixes the whole-wheat flour and water for the parathas. 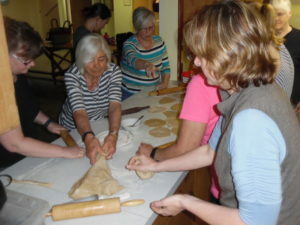 Class members knead the dough. 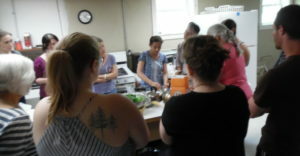 Delna explains the vegetables cut up for aloo gobi (potatoes & cauliflower). 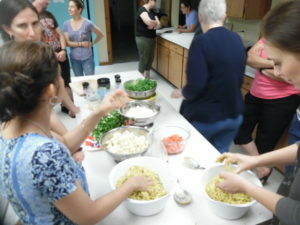 Participants get their hands into the ingredients. Frying the pakoras gets started. 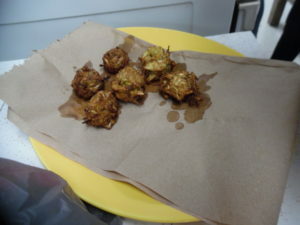 Freshly fried pakoras cooling down. 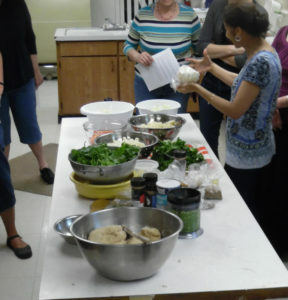 Delna talks about spices–what you can use, and how much: making it taste right to you! 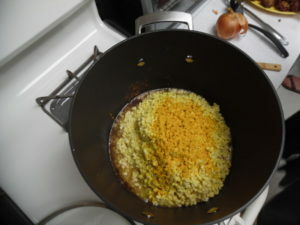 Mixing the ingredients for dal. 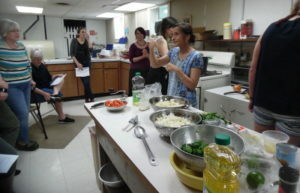 Dal ingredients are ready to cook. 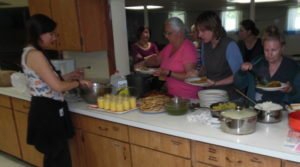 Rolling out the parathas and rotis. Everyone gets into the role, and the rolling. 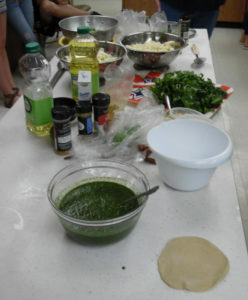 Green herb chutney, and other ingredients. 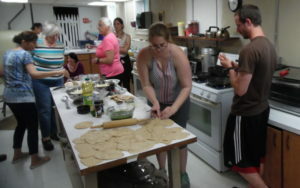 Dry-frying the parathas gets started–with many more to follow. 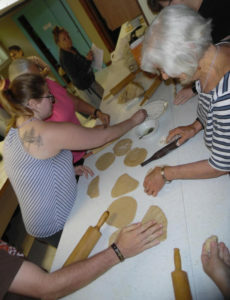 Parathas pile up, ready for cooking. 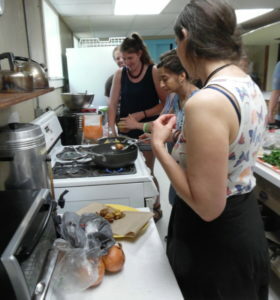 Aloo gobi goes into the pan for cooking. 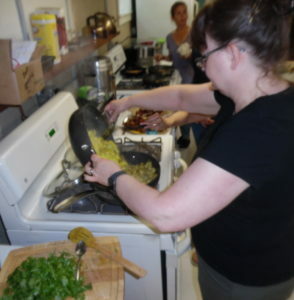 Delna starts the cooking of the aloo gobi. Dinner is served: mango lassi, pakoras, chutney, aloo gobi, rice and dal. 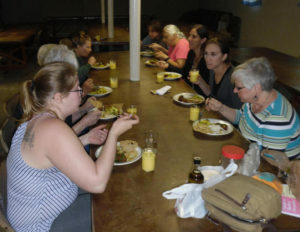 And dinner is enjoyed–and talked about. 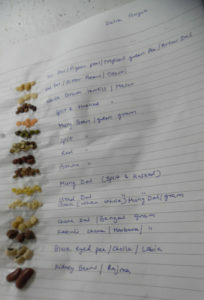 Delna’s visual aid for the many kinds of legumes used for dal.